You can click on any blue, bold words in this article to find out more information, or to be led to a specific product recommendation. Bonding with your Sugar Glider is an important part of establishing a relationship with him/her. It is easier to bond when a glider is young, but it is still possible to bond and form a relationship with a grown glider as well. Joeys or young gliders should be handled three to four times per day, for at least 30 minutes. Adult gliders may be slow to warm up, but with time and patience can become assimilated to a new family. Gliders can be shy or even aggresive at first when around unfamiliar surroundings, but by getting used to the new sights, smells and sounds, they will learn to adjust and bond to you overtime. Carry bonding pouches are extremely useful in helping with the bonding process. 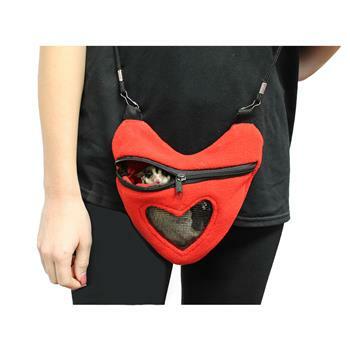 These are similar to nest pouches in the way that they provide a warm, comfortable place for a glider to relax, but they also have a zippered closure to keep a glider secure inside and a strap to carry around on a person. They are a safe and convenient way to spend time with your glider all day while they stay asleep in the pouch. Just walk around doing regular activities and your glider will get used to your smell of you and the sound of your voice. Another great tool to asisit with the bonding process are treats! Healthy treats have several benefits for both pets and pet owners. A treat can be any delectible snack, the most popular being yogurt drops or dried fruit. Treats can be used to coax a glider out of its pouch or hiding place and make human contact with you. 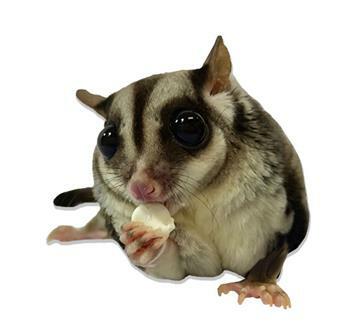 Feeding treats by hand help to form a connection between gliders and pet owners, and can help your glider trust you. Read more about healthy treats. The best advice offered is to be gentle and consistent in everything you do, be patient and loving. Do not pull away if the glider bites. They will try to tame you with their routine. Remember if you allow your glider to train you they will do so. It has always been... who will break whom in first. A rebellious glider just needs alot of TLC and patience. These little guys can sense your feelings. Do not get too worried if the glider takes more time to bond - just know in the end they will be the best they can be, and be your best buddy. Moving slowly around the glider works well also. They will not get jumpy if you do not get jumpy. Rub a paper towel on your face and neck and include it in the pouch. This will give them your scent. Just remember that time is what it is all about. You must remember the little joey is experiencing a new home, new smells, no more mom or dad, and lots of new noises. To remove your glider from its cage, wait till the glider is in his/her pouch and take the whole pouch out of the cage. Try not to force the bonding. Time is what you and your glider need. Do not chase your glider around the cage, this will make it harder to bond and create a relationship with your new pet.